As we've seen over the past few weeks, the Duchess of Cambridge's jewelry box is brimming with jewels set with precious and semi-precious stones. But she's also been loaned several pieces of jewelry by her grandmother-in-law, Queen Elizabeth II. Today's diamond chandelier earrings are among those borrowed jewels. 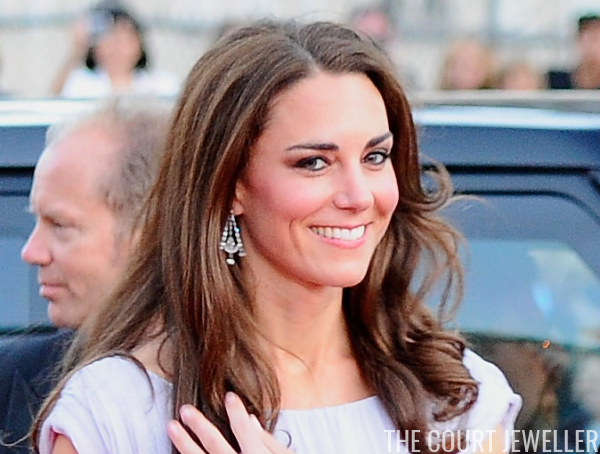 Kate first wore the earrings during the Cambridges' 2011 visit to Los Angeles. 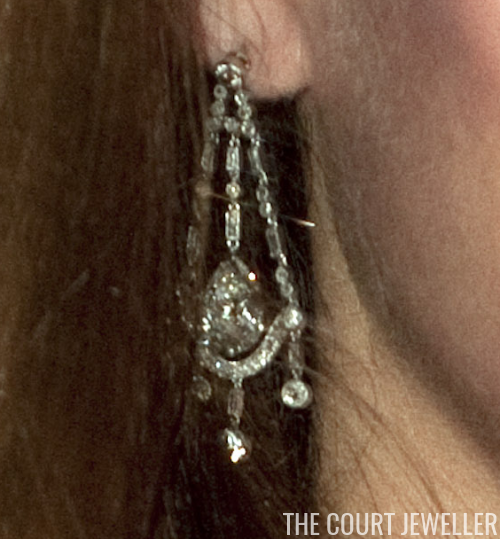 During that event, the press revealed that the earrings were on loan from the Queen, something later confirmed to royal blogger Anna by Richard Palmer of the Express. The earrings feature delicate diamonds in a chandelier design surrounding a large pear-shaped diamond. We saw the earrings on Kate for a second time as she arrived for the 2013 diplomatic reception at Buckingham Palace, and for a third time at the state banquet held for the Chinese president in 2015. On both occasions, Kate wore them with the Lotus Flower Tiara. 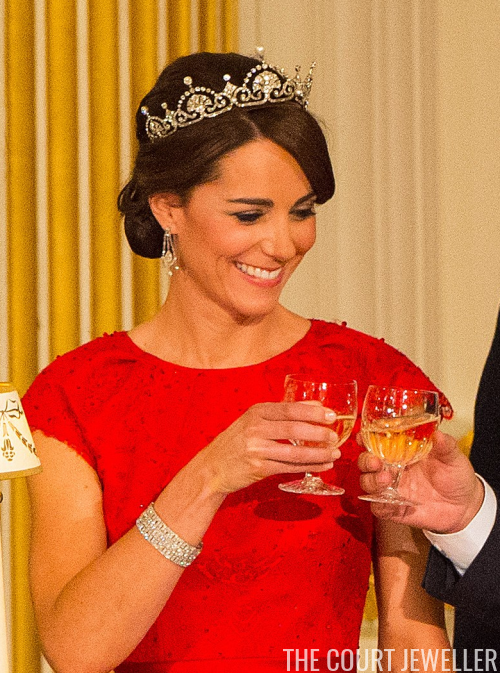 Kate wore the earrings again for the diplomatic reception last December, pairing them this time with the Lover's Knot Tiara. By now, the earrings appear to be a firm, long-term jewel loan from the Queen to Kate. To my knowledge, although the earrings belong to the Queen, we've never seen a photo of the Queen wearing them.